Yesterday I promised you a guest blogger, mystery novelist Deborah Donnelly. Due to circumstances beyond our control, Ms. Donnelly will not eventuate. Not on Day 4, anyway. She says hi. I’m speaking now to the new readers I’ve just detected, thanks to the stats dished out by WordPress. Are you lost? You’re not getting your money back! What you’ve stumbled on is a blog about popular music, but right now I’m engaged in a six-week write-a-thon that ends August 2. I don’t want to abandon music entirely, so I’m finishing each post with the musical picks and pans I wrote over the past few months. I’ve already run out of pans. And people say I hate everything! 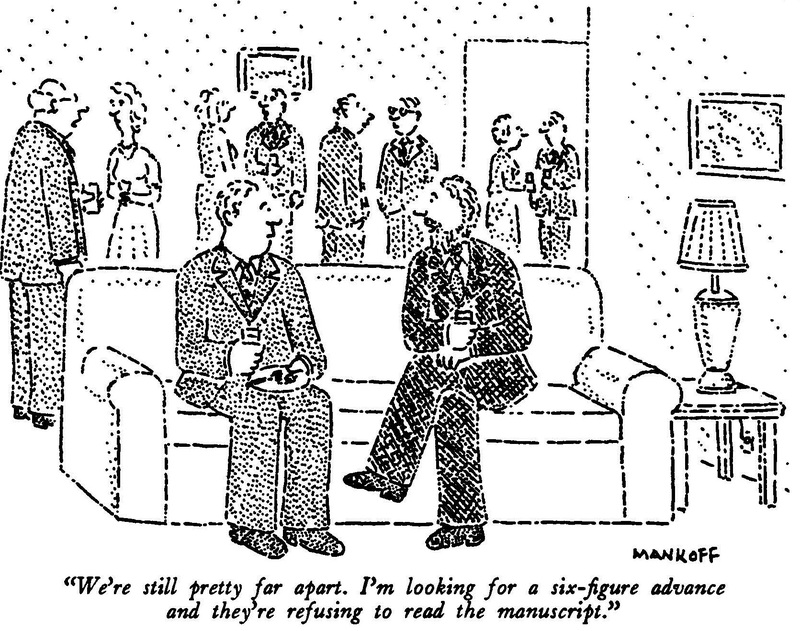 The writing cartoons have aged for years in my lifelong collection. The cultural references may provoke laughs but the themes are timeless. I’ve cleverly hidden indexes to the first two years of this blog (November 2010 to November 2012) in the left-hand column under Blogroll. You’re on your own for Year 3. Day 4 for me was like urban in-fill in most U.S. cities: packing more people into already established neighborhoods. Yesterday I solved the challenge of the chapter that goes forever on by breaking it up. Chapter 5 became much more manageable after I evicted a third of it. That section became Chapter 6. A few stray paragraphs became the opening of Chapter 7. My task today was to write a real ending for Chapter 5 and a real beginning for Chapter 6. I didn’t finish either but I know I’m headed in the right direction because I was surprised by some of what I wrote. “Where do I get my ideas? I don’t. They get me,” Lewis Carroll said. The problem with writing a novel the way I’m writing a novel, with a set of ideas rather than a set of ideas and a roadmap, is that I plunge into chapters without knowing exactly where they’re going or what they’re trying to accomplish. Everything takes longer than it should, even though I’m enjoying every minute of it. Maybe I don’t want it to end? I wouldn’t recommend my method to anyone. Maybe someday I’ll listen to me. The real treat on this album is “Factory,” in which The Vines pretend to be Nirvana pretending to be The Beatles.